Which U.S. president was the most pro-science? If you look back in U.S. history, you'll discover something profound. 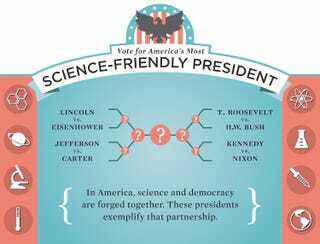 The presidents who did the most for science are evenly distributed between Democrats and Republicans. This isn't a partisan issue. But which of these presidents did the most to advance the cause of scientific discovery? Our goal is to highlight the role science has played in presidents' careers, whether it's Jefferson commissioning the Lewis and Clark expedition, Theodore Roosevelt pushing for the Pure Food and Drug Act or George H.W. Bush launching new Earth observation programs. The voting starts today, and the smackdown will continue for several rounds until we have a winner. Along the way, you're going to learn a lot about the science policies of past presidents — some of which will surprise you! Vote now! And think about which potential presidential candidates for the next election are pro-science, too.